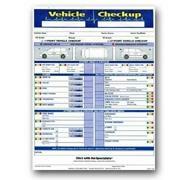 KARN Automotive Auto Dealer and Detail Supply - Service Department Inspection Forms Generic Vehicle Checkup Inspection Form Brand generic 3-part inspection form. 3 part. Pack of 250. Brand generic 3-part inspection form. 3 part. Pack of 250.